When people hear the word “consulting,” they often think of Harvard MBAs advising enterprise businesses on corporate strategy. They think that being a consultant means obtaining difficult degrees and certifications from prestigious universities in order to land a competitive job at a top consulting firm. They envision a fancy office with thousands of impeccably dressed staff members, each with a packed suitcase ready for yet another international flight. But in reality, this isn’t an accurate picture of consulting. The true picture of modern consulting is a lot closer to home, and you probably know someone right now making great money as a consultant. 36% of the US workforce is currently engaged in some form of independent consulting and contract work, and out of this group, nearly 20% of those working full-time are earning north of six figures. In this guide, we’ll discuss the definition of consulting, explore its true meaning, evaluate why people hire consultants, and show you how to get into the field of consulting. Let’s define consulting. 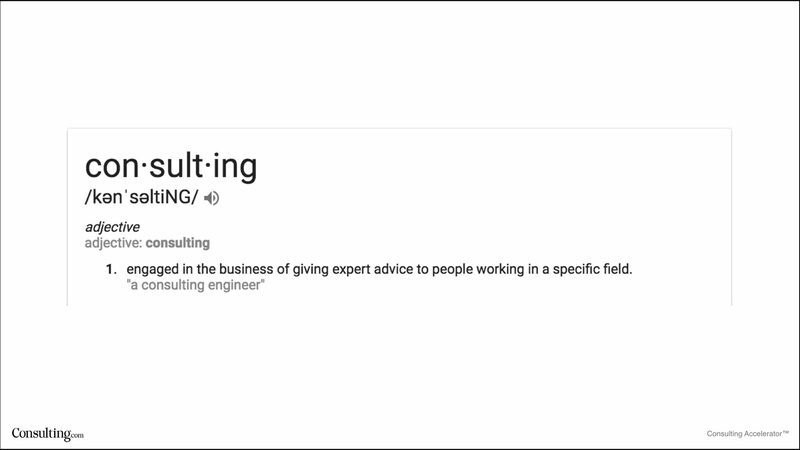 We’ll start with consulting’s definition according to the Oxford Dictionary. Consulting means “engaged in the business of giving expert advice to people working in a specific field.” In other words, a consultant is somebody who gives advice to a specific group of people. Consulting is the business of providing expert advice to a specific group of people. The definition is that simple. So what is a consultant? A consultant is someone who has some level of expertise that a particular group of people find valuable, and people within that group are willing to pay the consultant to access their expertise. And there is a lot of money in consulting..
PricewaterhouseCoopers’ consulting division brought in $15.9 Billion in 2016, making them the largest player in a $148 Billion consulting market. All this begs the question, why is consulting so valuable? Well, why do people ask for advice? The current state of things isn’t how they want it to be. They know what their desired state is, but they need your advice to get there. 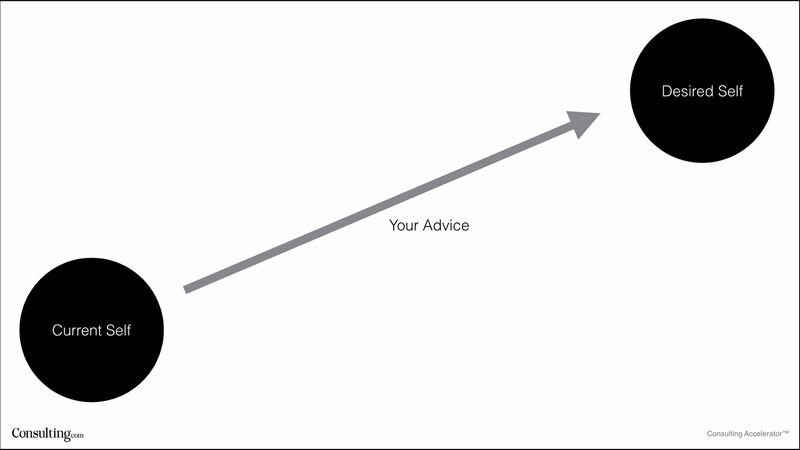 That’s why people want advice. They want to get from point #A to point #B, but they don’t know how to get there. They are either lost or facing obstacles they don’t know how to surmount. And that’s what consulting is. The true meaning of consulting is helping people solve problems and move from their current state to their desired state. And the more valuable that desired state is to someone, the more they are willing to pay for help getting there. For example, if a small business owner is making $60k per year and their goal is to make $120k per year, achieving their goal holds a value of $60k for them and they are likely willing to pay $5k, $10k, $20k, perhaps even up to $60k to arrive there. But money isn’t the only goal people have. The desired state might be six-pack abs. How much is that worth to someone? When we talk about more subjectively measured goals, the value will vary from person to person, but how much people are willing to pay might surprise you. There are normal, middle-class people out there paying $1,000 per month for personal training because getting the body they want is THAT valuable to them. That’s consulting in a nutshell: helping people solve problems and achieve results. So if reaching that desired state is so valuable to people, why don’t they just figure it out by themselves? They are simply unable to figure it out or get to their desired state on their own. They have a general idea, but they want to get there faster. They want to save time and effort by following an efficient, proven system. 1. They can’t get there on their own. Someone might have their current situation and they might have their desired situation, and they have already tried very hard to get there on their own, but it’s just not working out. Let’s say they are trying to lose weight. They go to the gym. They try different diets. They buy different running shoes. They try different things. They just can't seem to get it right. They tried and they failed, but they know it’s possible and they know other people have done it, and they just need to find that missing link. 2. They want to get there faster. People want to achieve things as quickly as possible. Really smart people also understand specialization, and that if they try to learn something from scratch, they are going to learn it significantly more slowly than having an expert teach it to them. If I'm trying to launch my first business, I’m going to make mistakes and do things inefficiently, slowing down my progress and increasing the time it takes to reach my goals. That’s an unavoidable reality as someone with no experience. But I’m not the only person on the planet. There are other people who have built successful businesses before, made the mistakes I will likely make, and learned how to do things efficiently. With their help, I can skip a lot of the biggest potholes and get to my desired state much faster. 3. They want a proven system to reach their goal. Some people simply don’t have time to guess or experiment. They want results and they want them now, and they know the ONLY way to achieve maximum efficiency is to follow a proven system from someone who has already accomplished exactly what they wish to accomplish. Want to lose 50 pounds in six months? Well, I’m going to go find someone who lost 50 pounds in six months and I am going to do exactly what they did. Want to build a 7-figure consulting business in one year? Well, I’m going to go find someone who built a 7-figure consulting business in one year and do exactly what they did. This desire for a proven system from someone who has “been there, done that” has created thousands of highly successful businesses, and it’s the reason virtually anyone who has achieved something of note can create a business selling that expertise to those wanting to follow in their footsteps. On that note, let’s look at the three main categories most consultants fall into. When someone says, "I'm a consultant," they are typically going to fall into one of three categories. The first category is management consulting. Management Consulting is what most people think of when someone says “consulting.” This field is dominated by large firms like McKinsey, Bain, and Boston Consulting Group, which are hired to help enterprise businesses improve strategy and operations or manage significant business events like mergers and acquisitions. And things don’t ease up once you’re in. You will need to be a top performer at each level in a promote-or-be-fired progression system. The second category is corporate consulting. Like the word “consulting,” the category of corporate consulting covers a massive spectrum of job descriptions and focuses. This is more of a catch-all category for those with a “consulting” job description in the corporate world. This can look like in-house consulting services, implementation teams, B2B consulting businesses, and a host of other things. As a general rule, people in this category have pursued the corporate track and often have at least a decade of experience in their industry. Fields where in-house consultants are common include software, IT, and other technology fields. The third category is independent consulting. Due to the diversity of consultants and consultant job descriptions, pinning down how much consultants make is a bit of a challenge. That said, we can at least provide some averages. If we include every job with “consultant” in the title across the three major salary tracking companies, Glassdoor, Payscale, and Indeed, we find that the average consulting salary is right around $75,000 per year. While that may not sound especially impressive, it’s actually quite high for an average. In comparison, the average white-collar professional salary is only $63,076. When we look at the three main consulting categories from above, we can begin to get a more specific idea of consulting salaries. The average management consulting salary is $92,867, and for people who work their way up the top firms, that’s chump change. For larger firms, salaries start around $70k, increase to around $150k after getting your MBA, hit around $500k at junior partner level and minimum $1 Million at the senior partner level. For independent consultants, it’s impossible to know the average, but we do know that nearly 20% of full-time independent consultants and contractors are earning six figures and above. We can also provide some data from our own training, which has had more than 10,000 students. Out of that group, 25 have broken the million dollar mark, 451 have crossed six figures, and over 3,100 have quit their jobs to do consulting full-time. Independent consultants can deliver their services in a number of different ways, but their journey tends to follow a particular evolutionary journey. Once you know the desired state your target audience is trying to reach, the next step is delivering the advice that helps them get there. There are a number of different ways we can deliver that advice. As a general rule, when we are starting out, we aren’t being paid solely for advice. We are often being paid for something tangible that we actually do for the client. Yes, our insights and expertise are part of the value, but the client is paying for a tangible service. As we progress and get consistent results for our clients, our advice becomes incredibly valuable on its own, and we get to the point where we can make so much money advising and teaching that we don’t even need to do the work ourselves (or we can charge tremendous amounts of money for that sort of service). The first delivery method is done-for-you. This is when you actually deliver the services yourself. If you're helping accountants get more customers, then you are actually setting up the entire lead generating system for them. You're setting up their landing pages. You're setting up their Facebook ads. You are delivering a turnkey service for them. This is the first stage of consulting, and it’s the most labor intensive. You can either do the work yourself, which is the most time-consuming, or you can outsource it, which tends to return the lowest margins and work quality. Or you can build a team to handle it, which comes with the most headaches. The second delivery method is done-with-you. This is the second stage of consulting where you don’t need to provide a “turnkey” service in order to get hired. You can manage a specific piece while simply advising on everything else. The third delivery method is 1-on-1 coaching. This is advising the client on what to do in a 1-on-1 setting. You could be going to visit the client in person, sitting down, and having a conversation with them. You're saying, "Look, here's what you're going to be doing. I want you to try this. I want you to try that," and then the client goes away from that meeting and does it for himself..
With 1-on-1 coaching, you're not actually doing any of the work. You're the advisor. You are being paid solely for your advice and attention. You are simply advising them on what work they're going to do and then they do it. The fourth delivery method is group coaching. This is advising a group of clients on what to do at the same time. Instead of doing it 1-on-1, you could do it in groups. You could sign up 10 or 20 people, have them all in one group, and then have calls. You can have a call every week and all these people could jump on this call and ask different questions. It would kind of be like a group of people being coached at the same time. This method retains many of the benefits of 1-on-1 coaching while allowing you to have more clients at any given time. And while it wouldn’t make sense for certain types of high-ticket, high-complexity coaching engagements, it is particularly effective when you are offering a more accessible price point while still needing to provide some level of personalization. The fifth delivery method is online programs. With online training, you create a complete, online training program that can be viewed at any time by any number of people, and then you simply let the clients learn themselves. This is totally hands off. Instead of doing the work for the person, they do all of the work themselves. The biggest appeal of this method is that after you create the course, there is no time commitment required from you when you land a new client. You simply deliver the course to them, and they do all the work themselves, allowing you to sell your course to a virtually infinite number of customers. If you're a consultant and you're just getting started, done-for-you is where you want to start because this is where you learn things. When you're doing the work for someone, you learn how it's done and you gain experience and glean great ideas from seeing what clients really need. It's the easiest to sell which means it's the easiest way to start getting some clients and the easiest way to start making some money. When it comes to scaling, however, the right delivery method is really going to depend on your preferred business model, with each one having various upsides and downsides. If you really like the done-for-you approach, you can scale an agency. You will need to hire and train lots of people, and keeping the work quality high can be a challenge. On the flip side however, finding clients who want a turnkey service is very easy, much easier than finding clients in a position to benefit from (and pay for) advice. If you have very high-level expertise, you can focus on landing consulting gigs with enterprise businesses or executive clients. With the right track record and connections, you can make more doing a 1-on-1 than a done-for-you consultancy will make with 20 clients. The simplest option is to create an online course. Provided you can find an effective means for scaling customer acquisition, this delivery method is the easiest, as you are simply delivering a digital product. Many consultants will evolve through each method over the course of their careers. In order to really know how to help people, you have to be hands-on, but hands-on isn’t infinitely scalable, so consultants often become less and less hands-on over time, working their way through each stage and finishing with online courses. That’s how Consulting.com founder Sam Ovens evolved into selling our flagship Consulting Accelerator training program. There are two primary ways to get into consulting. While getting hired into the consulting field is more competitive and more difficult than it’s ever been, starting your own consulting business has never been easier. With the rising costs of full-time employees, more and more businesses are looking for temporary and ongoing outside help, often in the form of consultants and done-for-you services. If you are interested in starting your own consulting business, there has never been a better time to get started. Here at Consulting.com, we’ve put together a helpful, completely free webinar that teaches you the basics of starting your own consulting business. Click below to sign up.